Bar/Line View: Labels both on AND inside bars? In version 2.7 when you stack a bar you get the values in the bars however if you un-tick the "Show value labels" it removes the labels from both inside the bars and at the end of the bars. Is there a way to remove the values in the bars (the stacked labels) and leave the values at the end of the bars? In 2.8 there is an option under the Scale menu to display one or both - the Stack labels (inside) or Value labels (on top of the bar). Not sure if I'm asking the same or a different question. I want to get rid of the labels inside bars, but it's not the values but categories. 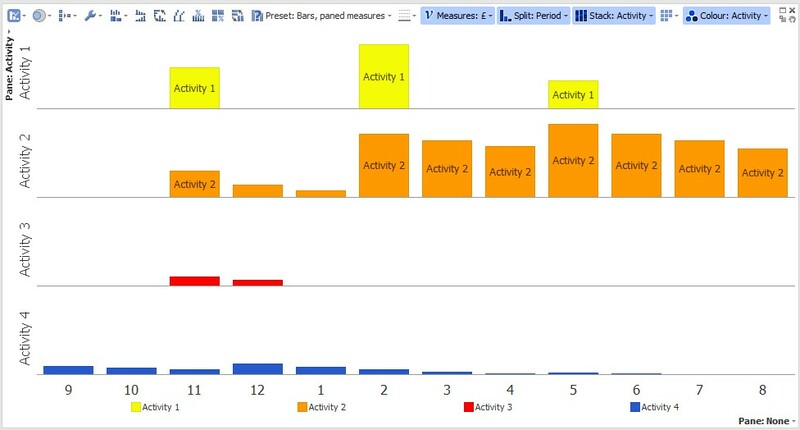 I've attached a screenprint - there is a legend at bottom and it is paned by the activities, so don't need the activities described in the bars also (particularly since they are not all the same because of the relative height of the bars). Probably missing something really elementary! You are stacking AND paning by Activity. Try removing stacking.